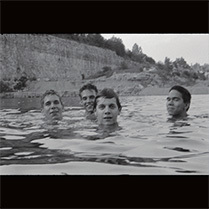 - Slint's 1991 album, Spiderland, remastered from the original analog master tapes by our friend Bob Weston at Chicago Mastering Service. This is the same version as was included in the Spiderland (remastered) Box Set. - "Breadcrumb Trail", the 90 minute DVD documentary about Slint before, during, and after the making of Spiderland, previously included in the Spiderland (remastered) Box Set, and directed by Lance Bangs. - A download coupon for the entire Spiderland (remastered) album plus 14 bonus outtakes and demos personally selected by Slint and mastered by Bob Weston. These are digital files of the same versions of these songs as were included on vinyl & CD in the Spiderland (remastered) Box Set The 14 bonus songs are not included on the vinyl album; they are included in this vinyl package as digital downloads only..
- A download coupon ONLY for the 14 bonus outtakes and demos personally selected by Slint and mastered by Bob Weston. These are digital files of the same versions of these songs as were included on vinyl & CD in the Spiderland (remastered) Box Set The 14 bonus songs are not included on the CD; they are included in this CD package as digital downloads only. -The 14 bonus outtakes and demos personally selected by Slint and mastered by Bob Weston. These are digital files of the same versions of these songs as were included on vinyl & CD in the Spiderland (remastered) Box Set. While the sold out box set included 180 gram vinyl plus CD versions of the bonus songs as well as a 108 page coffee table book, these new "HQ180 VINYL +DVD +Download", "CD +DVD +Download", and Audio-Only Digital Download packages still include all 20 songs in a more affordable format, providing a less expensive alternative to finding a box set on Discogs or Ebay. Order your physical copy of Slint- Spiderland (remastered) HERE, or your Digital Download copy by clicking the Purchase button on this page.